Regain your license with an ignition interlock! 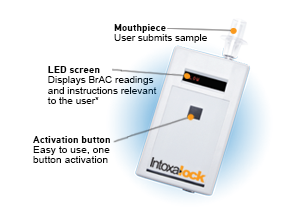 An ignition interlock device integrates breath alcohol testing with your vehicle’s ignition system. Prior to starting your vehicle, you will need to submit a breath sample into the hand held portion of the device that tests for the presence of alcohol. If your Breath Alcohol Concentration (BrAC) is below California’s ignition interlock limit (0.030), your vehicle will start. If alcohol is detected, your vehicle will not start until a passing sample has been provided. ​The state of California requires that all ignition interlock devices be calibrated every 60 days. A calibration consists of exchanging your current device for a newly calibrated one, ensuring accurate and consistent testing. 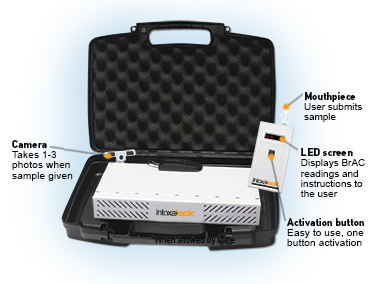 ​Intoxalock offers its customers auto-calibrations in the state of California. When it is time for calibration, the LED screen will display a message alerting you it is time to exchange devices. 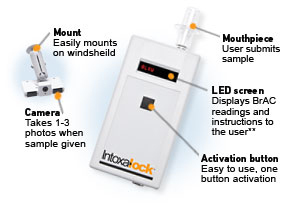 Intoxalock will automatically send a new one to your selected service center. You simply need to visit your service center during the allotted calibration period and the technician can quickly exchange the device.